I have a few new designs to play with from Whimsy Stamps... actually I'm not sure if this is a new one, but I needed to just sit and watercolor today, so I pulled out this Fishin' Friends image to work with. I filled up my watercolor palette last night so it was all fresh and ready to go. When the watercolor was dry, I used colored pencils to add some fine shading and details, and then a little gesso to add highlights. The sentiment I used is from the beautiful Fill My Heart set - I thought it was a sweet addition to this tender scene. I used the largest of the Hand Stitched Nested Rectangles dies to cut the panel to an A2 size. 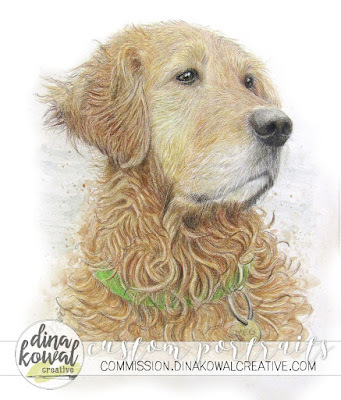 I finished up a portrait this weekend of a golden retriever who loved the water - that fits well with my card today. She was fresh out of the river after a swim when the photo was taken, and it was fun sketching in all her curls of wet fur. If you'd like to see the progression of her portrait, you can click over to my business site here. My project fits this month's Whimsy Challenge, so I've linked up there as well. That's all I know - I hope you're having a great week! The sentiment is perfect for this sweet image. How did you use gesso to highlight? Doesn't it dry clear? Thanks for sharing your dog portraits with us - absolutely beautiful! This was white gesso - sometimes I use white acrylic paint for highlights too. Its sooo gorgeous, and you colouring sooo beautiful. Thank you for joining in our challenge at Whimsy stamps Challenge blog. Darling image! And, awesome coloring. Fabulous portrait. You are so very talented. Such a sweet image! Thank you for joining in the Whimsy Stamps Challenge this time. Hope to see you again and good luck.